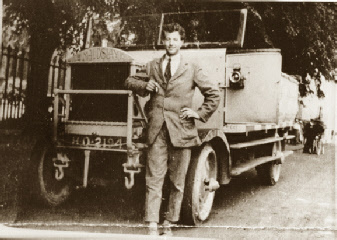 In 1921, at the end of World War One he purchased a Maudslay truck from the War Department. His skills are put to good use when he converts it to a charabanc. 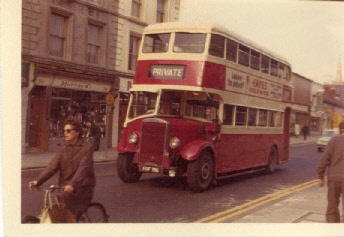 This is, indeed, the first Hutfield coach, in what became a fleet of over 700 vehicles (throughout the country) in its heyday. 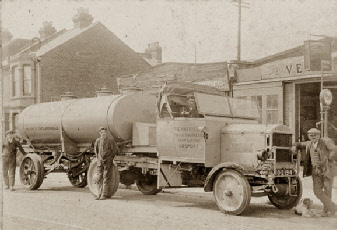 In 1925 he again modifies this chassis into an articulated fuel tanker. This is reputed to be the first motorised articulated vehicle. This picture is taken in Brockhurst Road, outside his garage, (now Reekies). 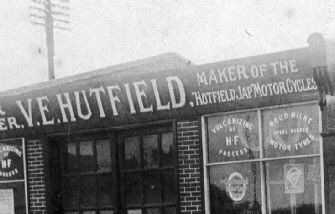 Can you supply any information on the Hutfield JAP Motorcycle? 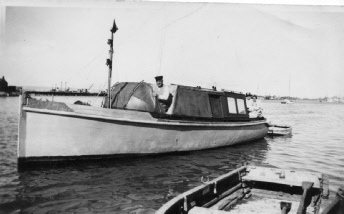 Vic on his boat in Portsmouth Harbour. Click here to see Fleet List of Hutfield’s Coaches. Leyland Titan, new New to Southdown 24/6/1938, acquired by Cecil Hutfield on 1/3/1956. 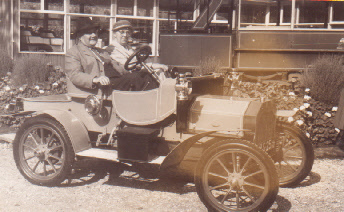 In this photo Vic is sitting in a 1904 Brushmobile, registration number HS 25 at Beaulieu Motor Museum. We understand that Vic gave several cars to Beaulieu but cannot confirm if this was one of them. This car was later used in the carry on film; “Carry on Screaming”. Now understood to be on display at the National Automobile Museum Sepang International Circuit.